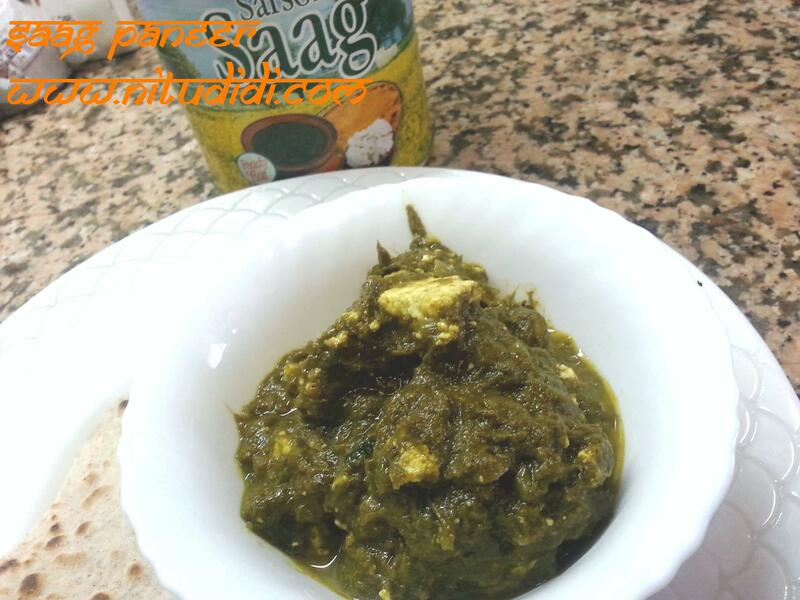 Saag paneer is a real favourite desi restaurant dish. I know soo many people who just love this. I have published umpteen ways to make this recipe and today here is one more version! Talk about confusion! This is an easy recipe made in an instant with a can of ready to heat and eat saag! I usually never believe in canned or ready made pastes, but there is always an exception. This can of saag tastes as good as the real thing! So…. just add some paneer, boiled potatoes, sauteed chicken or lamb to have your favourite saag dish. Heat the oil in a pan and first add the chopped garlic and sautee till it starts changing colour. Then add the ginger and sautee for a few seconds, and then the onion. Cook the onions till they are transparent and then add the ready to eat saag. Cook it for half a minute and add the paneer which you have cut into pieces. Add the spices and the water and bring to a boil. Serve with naan, rotis or parathas. Simply delicious and easy to make. If you do not feel like chopping garlic , ginger and onions, just heat the saag and add the paneer to it. Canned saag is a mixture of mustard leaves, spinach leaves and green chillies. It is a typical panjabi dish to be eaten with makki di roti (which are rotis made from cornmeal flour). The mustard leaves give this a very tangy and strongish flavour which gives this dish its distinctive taste. This entry was posted in Everything Vegetarian, Fusion, Gluten Free, Healthy Options, Indian Restaurant Dishes, Recipes with videos and tagged paneer, saag, vegetarian. Bookmark the permalink.